Hello to all my blogging Friends! 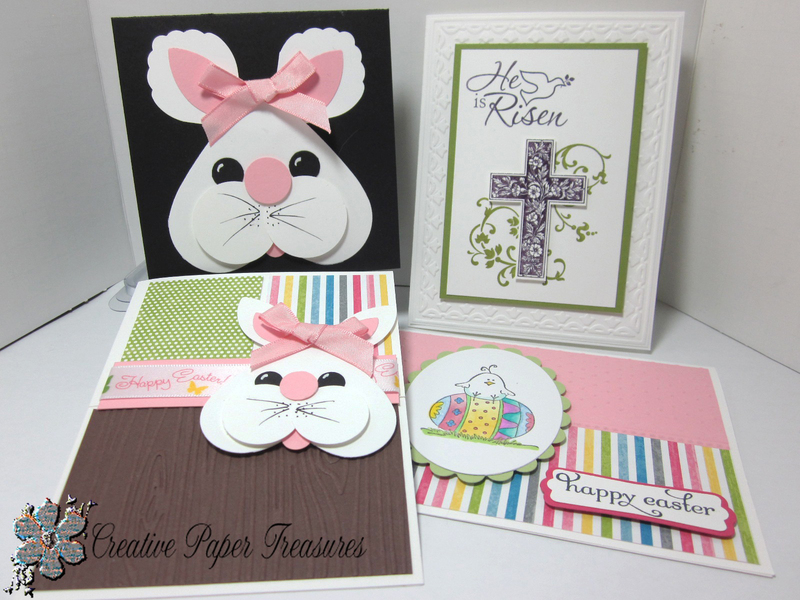 Today I would like to show you some Easter cards that I have scheduled for my card class this month. The bunny cards are actually gift card holders. I cased the black card from Glenda Calkin's site HERE. The brown card has a smaller bunny and the instructions to make this card can be found HERE. I cased the cross card from this site. The chick on egg is a non-Stampin' Up! stamp colored with Copic markers. If you have any questions, please don't hesitate to drop me an email message. I hope today's project gives you some inspiration to create your own set of Easter cards. As always, I welcome your comments and suggestions. These are so beautiful Diane, really great work, well done hun. I totally love this little bunny here on the 2 cards, and that´s just something the girls would love and be abkle to make too, I think, so better try and get over to see by those, who made them first, I gues. TFS and have a great week-end ahead.